I have always lived by the mantra that "less is more." But sometimes, more is more. And when it comes to statement jewelry, more is always more. I'm usually one for statement necklaces (and statement necklaces only.) That is, until I came across this little beauty. Lust at first sight is an understatement. I think my heart skipped a beat. 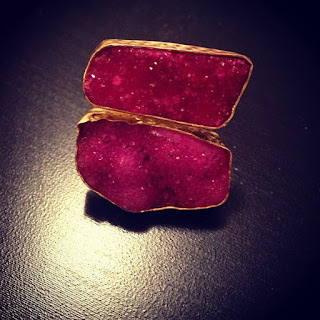 With spring and summer just around the corner, the Barbie Ring by Beso Beso by Luka is my go-to accessory. The best part? The color somehow mysteriously goes with just about everything in my closet. I think it has that "statement" effect. Do you ever see outfits where a piece of jewelry looks like it shouldn't match with a certain outfit, but it mysteriously goes together perfectly? The Barbie Ring has that same effect. I'm obsessed. Seriously, you need one now. I won't even get upset that we have the same ring. In addition to the Barbie Ring, I'm going to be wearing a few other dazzling pieces by Beso Beso. A few of my favorites? 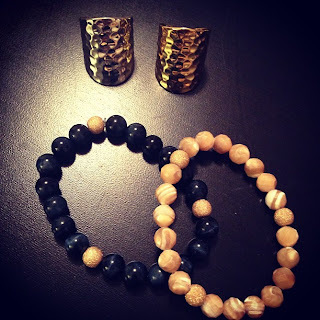 The Candace Ring, Black Onyx and White Mother of Pearl Arm Candy Collection Bracelets. LOVE. Summertime, here I come. If you're in love like I am, check out Beso Beso by Luka now. If things could even get any better, you get loyalty rewards for rating a product, emailing the product to a friend, having a birthday and a ton of other things. Seriously, these guys are good.